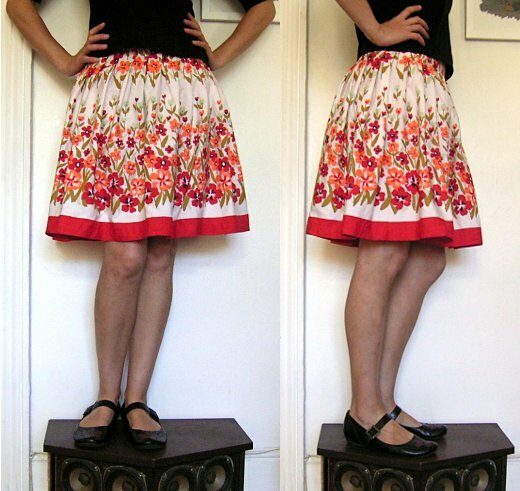 Another skirt, this time using this tutorial. I didn't bother with a waistband, but sewed the top of the pleats down so that they don't puff out directly from the waist. Added a zip and a press stud on the last pleat, which neatly covers the zip - sheer luck, that. Love the skirts you are making Jesse....although I will say this one is my favorite so far! ooh! that is just adorable! It's stunning! Where did you come across this kind of 'border' fabric? it's really lovely. I found the fabric a few years ago at a sale of what seemed to be end-of-roll quilting fabric, in a makeshift kind of shop in a warehouse. It's since disappeared, sadly. I´m in love with this skirt!